Helen Wilson is the owner and founder of Greenland or Bust. Helen is internationally known for her rolling and traditional skills instruction. She has traveled to Greenland several times to compete in the Greenland National Kayaking Championship and/or to guide expeditions on the east, south and/or west coasts. Helen performs rolling demonstrations, presentations and instructs at events worldwide. She is the organizer of the US Storm Gathering Symposium. Helen has two DVDs, Simplifying the Roll with Helen Wilson and Yoga for Outdoor People, and has written skills articles for several publications; including Sea Kayaker Magazine, The Masik, Ocean Paddler Magazine and Canoe & Kayak. 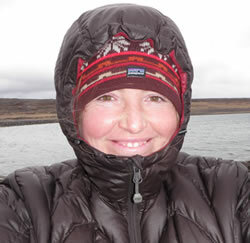 She is on the Board of Directors and the Secretary of Qajaq USA, the American Chapter of Qaannat Kattuffiat – the Greenland Kayak Association, and is also the Editor of Qajaq USA’s publication, The Masik. Helen is an ISKGA Coastal Guide and an ACA Instructor with an ACA Rolling Endorsement. She holds the DGI Certification (Denmark coach certification) and is a registered yoga teacher (RYT) and a Wilderness First Responder. She is also the Curriculum Publications Managing Editor and a Field Instructor for NOLS. Contact Helen at helen@greenlandorbust.org if you have any questions or would like for her to attend an event.